You guys! It’s truffle season! And, of course, being Frugii, Frugii decided to add a Black Truffle flavour to their menu. How could I resist? It was a tough call – pair it with Dark Chocolate or Fig? – but in the end I opted for Fig, noting that truffle is an excellent flavour-enhancer. The Black Truffle icecream ($6) has a really clear, distinct truffle flavour, which isn’t for everyone – it’s hard to describe, but there’s a real complexity to the taste that I loved. I tried the Fig on its own, and was so impressed by the authenticity of the flavour, but when paired with the Black Truffle in one mouthful, all my taste buds activated and my mouth started watering! I was particularly excited by the texture of both the icecream and the sorbet. There really wasn’t that much difference between them (such good sorbet, not icy at all) and the creaminess was absolutely beautiful. Frugii portions are always great value (no extra charge for two flavour choices) and the service remains impeccable. 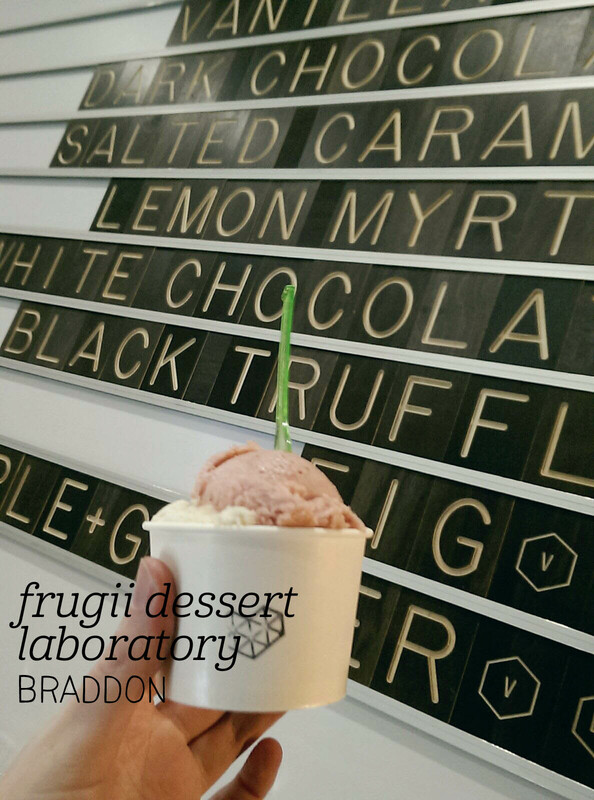 Definitely get down to Braddon and try the Black Truffle flavour (with any pairing – let me know what you try) while it lasts! 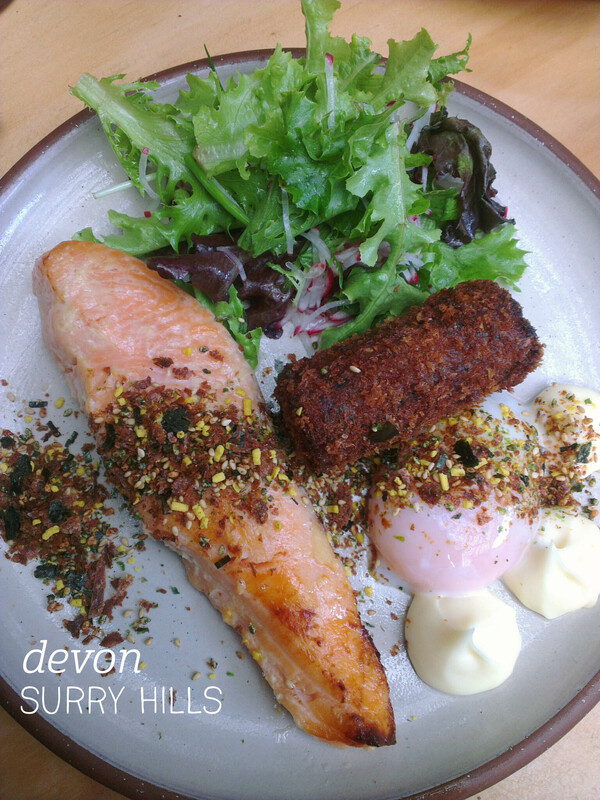 I was so very excited to see that one of the breakfast/brunch options at Devon was salmon. It’s quite rare to find a Japanese-style breakfast, so we were happy to wait for nearly 30mins to get a table. Seated in the back courtyard, we ordered right away, tummies grumbling from the wait. I chose Breakfast with the Sakumas ($25), clearly a staple menu item, of miso-grilled salmon, smoked eel croquette, 63 degree egg, radish salad and kewpie mayonnaise. The plate was beautifully presented, and I broke open the croquette before cutting my egg, so there was something to absorb the perfectly runny yolk. The croquette was delightful – don’t be put off if you’re not a seafood fan, the eel flavor is subtle, and the brown rice inside makes this a surprisingly filling portion. But the main game is definitely the salmon, which shines brightly amongst all other salmon dishes. Perfectly flaked and tender, and topped with a crisp seaweed and spice crumb (amazingly good), this was a complete delight and something I would go out of my way to eat again. The radish salad broke up the rich flavours of the rest of the dish, bringing perfect balance and sending me right back to Tokyo breakfasts past. I haven’t been to A. Baker for quite a while, so when I had to pick a venue to meet a friend about to move overseas, I took a risk and went for it. Luckily, the standards at A. Baker have remained high, leaving my foodie reputation in tact. 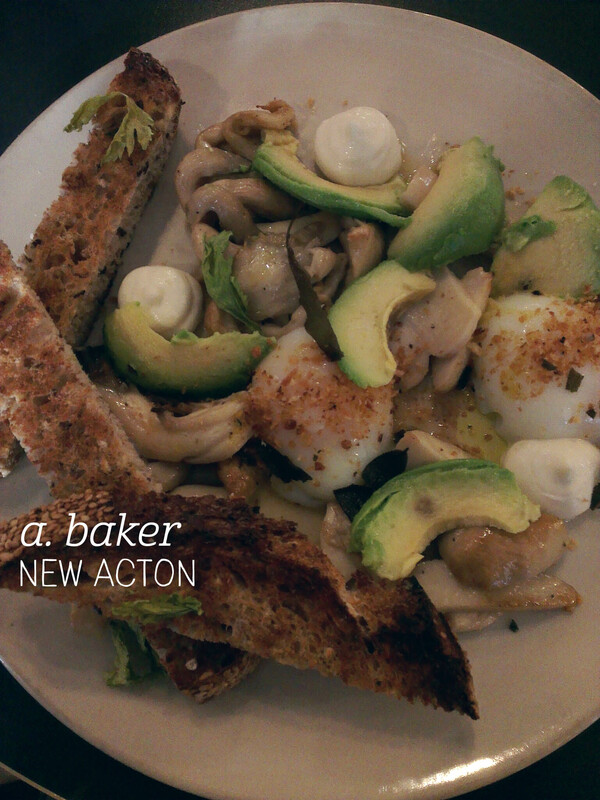 We both ordered the slow cooked eggs, served with local mushrooms, smoked ricotta, soldiers and lemon ($17), and I added avocado ($5). Firstly, the bread here is fantastic, and the three soldiers were an utter delight to eat – they were also quite filling. 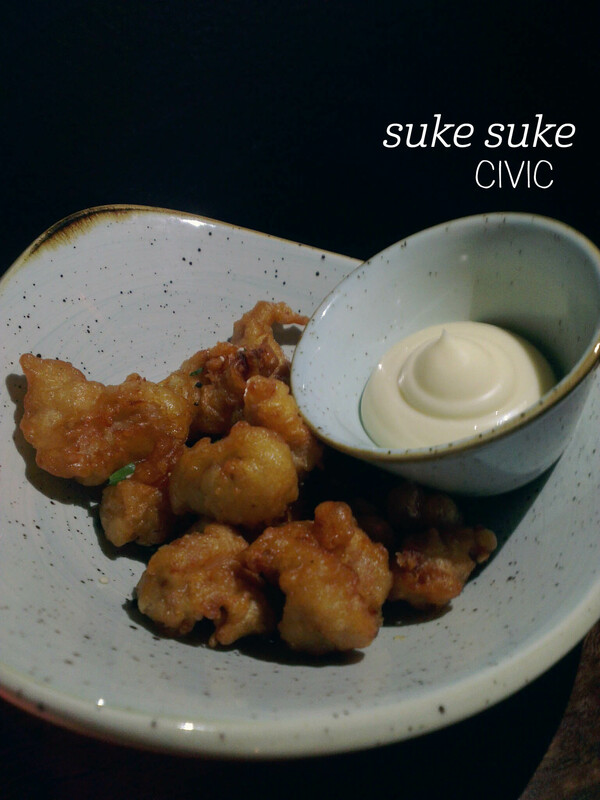 This dish is all about the mushrooms, which were plump, fresh and full of flavour. I kept getting these hits of saltiness from what I presume was the pan juices from the mushroom, which went perfectly with the creamy ricotta, although I found the smoked flavour a bit subtle. I had expected the eggs to remain runny when slw cooked, but the yolks were soft but not runny. The crumb on top added great texture, and I really enjoyed the added avocado. I also ordered a fresh orange and apple juice, which was exactly what I wanted at the start of the day. A perfect setting to wish my friend bonne chance. I dined as a guest of the Truffle Festival; all opinions remain my own. Following an incredible truffle hunt (see my Instagram for the full story), we returned to Tarago Truffles for a 3-course truffle lunch by staff from 3seeds Cooking School. First up was the most delicious cauliflower, parsnip and truffle soup – I went back for seconds (and thirds – shh, don’t tell anyone!). The soup was beuatifully creamy and had a generous amount of truffle inside; enough that you could distinctly taste the truffle itself. This was paired with a slice of bread with truffle butter on top. If you haven’t tried truffle butter before, get on that bandwagon now! 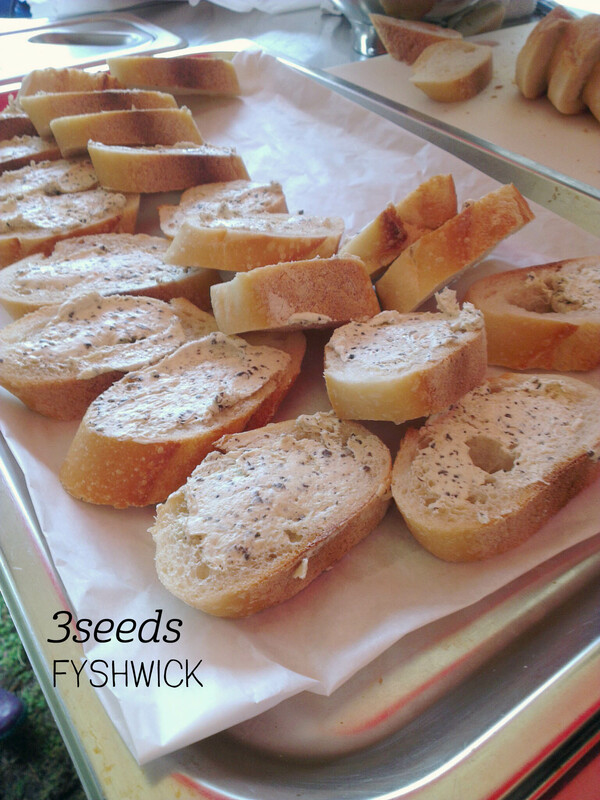 The folk at 3seeds really know how to make the most out of this magical ingredient. The second course was the divine portobello mushroom tart, topped with truffle salt. The pastry was so buttery and rich, and the whole portobello mushroom was really plump and tender. Finally, we indulged in a sticky fig pudding, served in a caramel sauce with truffle butter – again, the truffle just lifted all the flavours, while still being present enough to taste. We were also treated to some insider tips on how to make the most out of a truffle; the perfect way to end a truffle-themed day! I spent a lovely afternoon at the Opera House to see The Australian Ballet, and on my way back to the train I treated myself to a cup of Baskin Robbins, which seems to have disappeared from most other Australian cities. Whilst Love Potion #31 is my absolute favourite, I wanted something a bit lighter, so opted for the ‘Citrus Twist’ – “ice made with the tangy twist of lemons and limes”, according to the sign. Refreshing and dairy-free equals fine with me. I think the description on the sign was pretty accurate – there was still a fairly smooth, although certainly more icy than icecream, texture to the Citrus Twist, and the mixture was actually quite sweet compared to other lemon and lime flavours I’ve tried. Having said that, the flavours worked well together, and would suit those who don’t want a sorbet that results in cheek-puckering bitterness. The serve was reasonably sized, and it delivered on the ‘refreshing’ promise too. 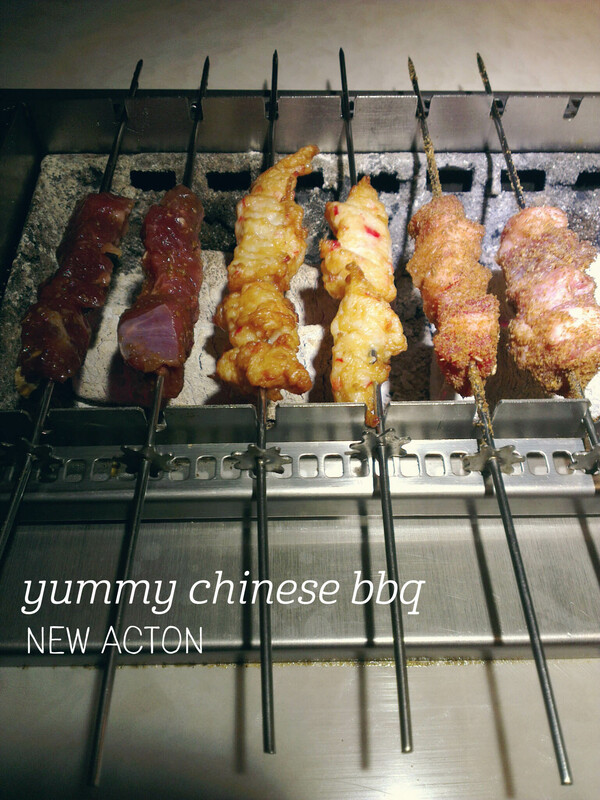 Like most places, you can enjoy a complimentary taste to help pick your flavour. 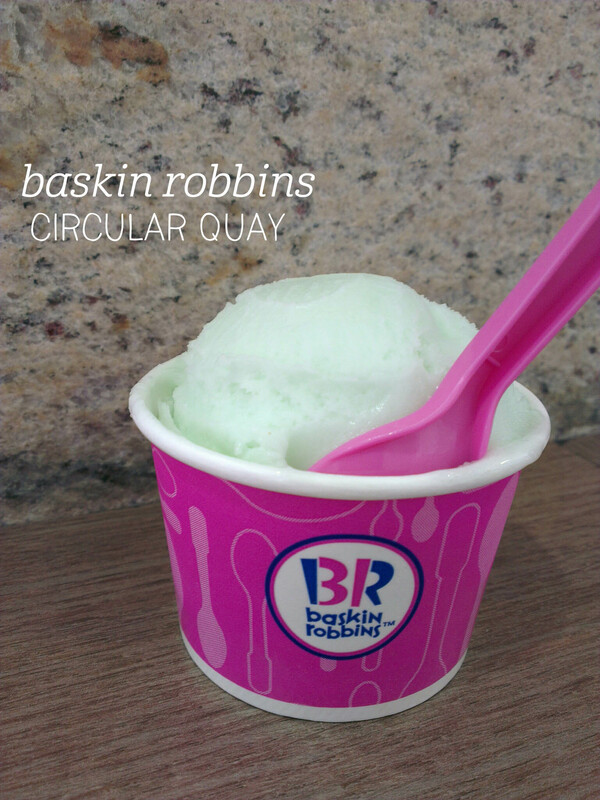 With such great Harbour views, it’s hard to look past for an affordable sweet treat in Circular Quay.